Labeling machine is important equipment in the packaging process of every industry. Products after manufacture are labeled with stickers or with the other alternate methods for requirements like unique identification of the products and conveying product information to the users. A sticker labeling machine is the most widely preferred labeling machine tool used for economical product labeling processes in industries. One may get a sticker labeling machine for labeling front and back sides of the products, back, side or top parts or for wrap around labelling of the products to attach stickers around the body of the product. Today there are labelling machines that operate manually as well as those which can perform the entire labelling process right from the feeding of the bottles, picking the labels from the stack and attaching the labels onto the products automatically, without any manual help. There are few features of a sticker labelling machine which one should unfailingly look for when buying a bottle sticker labeling machine. User-Friendly Controls A machine should be easy to operate for a convenient and safe operation. Therefore user-friendly controls are desired for a machine. Selecting a labeling machine with user friendly controls is thus important, if you desire a comfortable and safe labeling operation at your manufacturing unit. PLC Controls for Automatic Machine Operation A labeling machine with PLC controls allows automatic labeling processes. Therefore the production costs as well as time required for the packaging at the manufacturing units is greatly reduced with an automatic labeling machine with PLC controls. Quality of the Components Before buying a labeller machine for bulk processes in industry always make sure that the machine is made of the best quality and standard components because after all it’s the quality of components that will help a machine give an efficient performance for longer period of time. Only a rugged design machine can give optimum performance in robust working environments of the industries. Energy Saving Features A sticker labeling machine with energy saving features can cut off the energy consumed during the packaging process and therefore can reduce the production costs of the manufacturers. Vision System and Machine Stop System with Alarm Machine stop system with alarm is a feature which helps in reducing wastage at the manufacturing units. The alarm of the machine stop system will ensure that machine does not remain working even in conditions like label roll is empty or label roll is missing out or for any other improper working condition of the machine. Many machines have vision system for barcode detection of labels. This vision system checks if coding on the labels is present or not and therefore signals the user in case if left out. Conclusion: Therefore by looking out for the above mentioned factors while buying a labelling machine, one can ensure a proper selection of the machine for efficient labeling processes for maximum performance with minimum wastage. 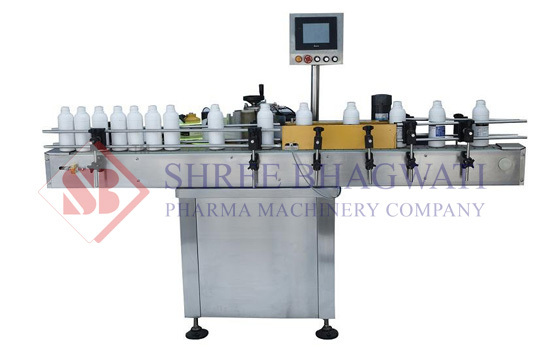 Most important of all you should always select a machine that suit your requirements of labeling like bottle labelling, jar labelling or labelling of any other type of product on various parts like front and back, sides, top etc. This article educates reader about sticker labelling machine and features desired in the sticker labeller for efficient performance.